COLOURS: If you want a bespoke RAL colour for your 4 Shelf Container Trolley you must state this in the comments field when ordering & we will contact you for details. Note that this takes up to 20 working days and is an extra 10% on the net price. What is the purpose of the Wide Board Shelf Container Trolley? The 4 shelf office trolley has a multitude of uses, including separating tools, keeping packages organised, and moving various supplies. Use the four shelves to keep items safe while in transit or stored away in a closet. Where can this Shelf Container Trolley be used? 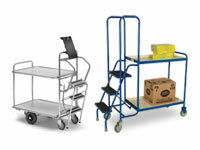 Use the four-tier trolley in the warehouse, on the factory floor, and in the office. Sorting facilities will find it helpful for keeping orders handy, and the board shelf is easily moved from location to location in order to keep things running smoothly. 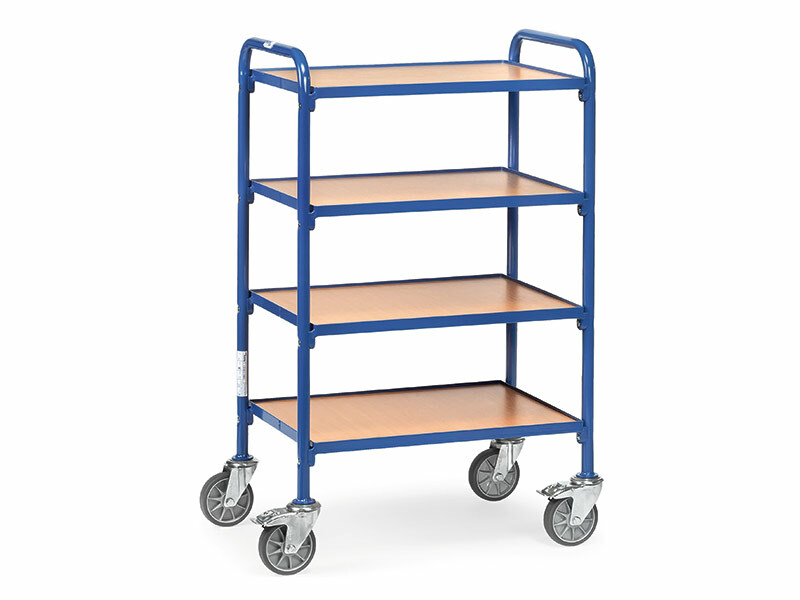 Who might use this Container Trolley? Employees will enjoy using the 4 shelf industrial trolley, with its easy-to-manoeuvre steering and convenient brake system. In the workplace, the trolley can help with multitasking, organisation, and storage. Backed by a 10-year parts and labour warranty, the board shelf also comes with a price promise and a 10-15 working day delivery time. A capacity of 250kg means you can use this product for a variety of storage and transport uses. The strong tubular and angle steel construction combined with shelves made of timber board make the container trolley sturdy and efficient. 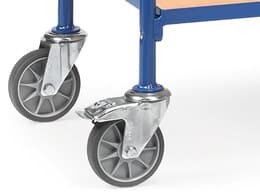 Four castors with non-marking TPE wheels, two of which include brakes, and a blue powder coated finish makes this trolley perfect for a number of environments. 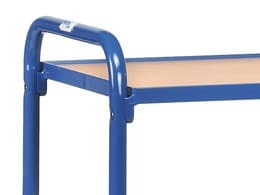 Supplied blue as standard but you can choose a colour to suit your commercial needs and keep trolleys in designated work areas- please call for a quote. The Workplace Depot has everything your business needs to keep it running smoothly and most efficiently.